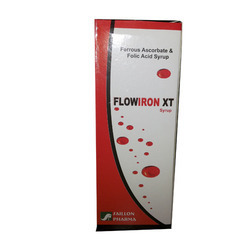 - We are occupied with giving the best quality scope of Folic Acid and Zinc Sulphate Syrup. Rinofer Syrup Is The Perfect Combination Of Iron, Calcium, L-Lysin, Zinc With Vitamin B Complex. This Kind Of Preparation Is area In Pharma Market. We have haematinics availabel in different formulations like ferrous ascorbate, ferrous fumarate, ferrous sulphate along with folic acid. Available in bottle of 200 ml & 100 ml brut and round shape. With our profound expertise in this field, we are instrumental in offering our clients a wide range ofCarbonyl Iron 100mg. , Zinc 22.5mg., Vitamin C 75mg. 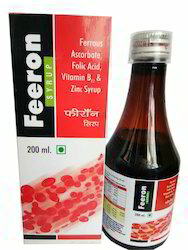 FERROUS ASCORBATE 100MG+FOLIC ACID-1.5MG+ZINC SYRUP. In order to cater the variegated demands of our clients, we are offering an excellent quality range of Folic Acid Syrup.